The real estate profession is fraught with challenges and obstacles. Stress levels often run high and maintaining a positive pristine attitude can be difficult. The business of the real estate transaction has many moving parts that can run off the proverbial road. It is the largest most emotion packed purchase or sale most customers will experience in their lifetimes. Consequently, Realtors are expected to “wear many hats”: housing market expert, community resource, schools system consultant, and psychologist to name a few. Compensation is almost exclusively on a 100% commission basis. Each Realtor is CEO running their individual businesses. Expenses are out of pocket and rarely if ever subsidized through a traditional “salary” or car compensation package. Compounding a Realtor’s stress level are uncontrollable factors. Constantly changing housing markets, interest rate fluctuations, buyer and seller indecision, unreal buyer or seller expectations, and stiff competition are always part of a Realtor’s life. With all of these factors in mind, becoming a successful real estate agent or professional is often a long road of hard work, perseverance, luck, and preparation. What is so often left behind, in the rush to perform all of these functions, is the awareness that positivity in attitude and thought is vital to success. I am happy to announce a new series that will focus on positive thinking, stress management, and maintaining positive attitude/energy. I am very excited to announce Susan Hanshaw as a major contributor and driving force behind this project. 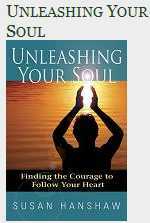 The author of Unleashing Your Soul: Finding the Courage to Follow Your Heart and blog Sanctuary for Change, Susan was a recent guest on Maggie Mistal’s “Making a Living” formerly “Career Talk” show for Martha Stewart “Living” Radio channel on Sirius Satellite Radio. Susan’s business includes inspirational coaching and speech writing. Welcome Susan! In “Victims of Okun and McGhan: Where Do We Go For Answers” I made a plea to any politician or participant in the tax proceedings for fresh information and answers. The answers I was hoping to elicit were the type that would describe exactly why the losses occurred and how they would be avoided in the future. I then reprinted two comments I received from two separate victims of each of the 1031 swindles. My goal was to show everyone (reading this blog) the hurt and anger the victims are feeling. In addition I wanted to highlight cases where the victims had lost most if not all that they saved for their retirements. Real people devastated by this situation. A look at the unfortunates. Although it is early, as expected, I received nothing from any of the politicians who claimed to be “looking into” or “working” on legislation for 1031 Exchange reform. As I expected, I have heard nothing from the Federation of Exchange Accommodators- Qualified Intermediaries only trade organization. “We devise and execute communications campaigns that create and sustain competitive advantage. Clients involved in high-profile litigation depend on us for strategic communications counsel to press their case in the court of public opinion.